With an unabashed love of life, Phil and Benita McCormick could have written the book on aging gracefully. Open to new generations and ideas, even well into their 70s and 80s, they blazed boldly forward into the changing world and never looked back. 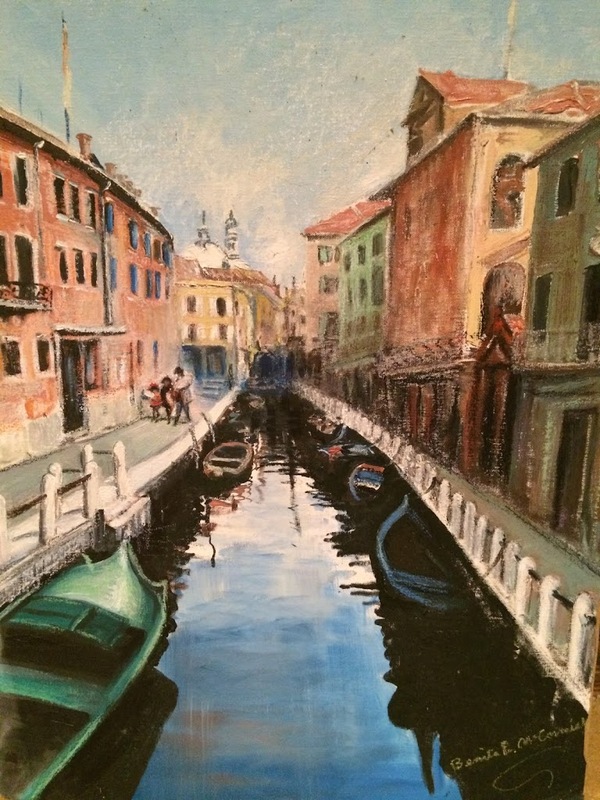 Venice Canal, by Benita McCormick. 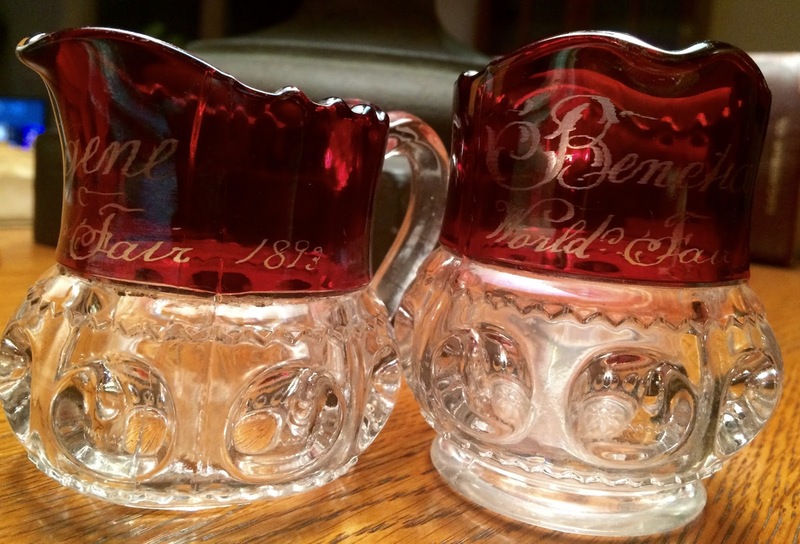 From the collection of Suzanne (Olson) Wieland. In the late 1960s, they moved into the resort-like Woodlake complex, at 820 Delaware Avenue in San Mateo, California. (You can see a map of the large complex here.) The complex offered a wide variety of facilities and social activities for its residents of all ages. Uncle Phil was an avid reader and continued to study conversational Spanish and do crossword puzzles. He loved spending time outdoors and thrived in the California sunshine, taking long daily walks, playing golf, and cheering on the San Francisco Giants baseball team. Aunt Detty busied herself painting and teaching art classes, writing, and taking on various entrepreneurial projects. A devout Catholic, she had helped some people convert to the faith and wrote about the experiences in a couple of articles published in Catholic Digest. A woman ahead of her time, in her late 80s she studied Eastern philosophy of the human body; this led her to promote the benefits of acupuncture and bee pollen. She believed the brain could be exercised to keep it sharp and fit, much the same way one exercises the body, and she even named her brain “Corty,” short for cerebral cortex. It was always a treat to visit my great aunt and uncle. My sisters and I would pile eagerly into our family’s blue 1969 Chevy Brookwood station wagon for the 40 minute drive up Interstate 280 from San Jose to San Mateo. Knowing a good story or some surprise was in store, we’d race to ring the doorbell and jump up and down impatiently for the sound of the buzzer to unlock the building door. The elevator ride to the third floor was another novelty. I can still hear my mother reminding us to walk, not run, as we dashed past our parents down the corridor and around the corner to apartment 307. Aunt Detty was always ready to greet us at the door, her eyes sparkling and arms outstretched to greet us with those loving Irish hugs and kisses. Uncle Phil would be waiting inside, his beret already on his head and a putter by his side, ready to swoop off the antsiest of us downstairs to the putting green or poolside. With a wink at my father, he’d hold his hand out to the wiggle-worms, and off they’d go. While Aunt Detty and my mother went into the kitchen to prepare coffee and treats, there was time to scan the walls and table tops to spy what was new or rearranged since our last visit: a Spanish Talavera plate, a family memento, or one of my aunt’s many oil paintings. A must-see was the bathroom wall, where visitors scrawled messages and left silly jokes and sketches. There was a story behind everything, and our aunt was only too happy to recount them, occasionally embellishing a bit for her receptive audience. She continued to be a prolific artist, and the walls of Apartment 307 were graced by a rotating exhibit of her latest or favorite works. There were sketches and oil paintings of the McCormicks’ travels around the world – New Mexico, Italy, Spain, Mexico. There were still lifes – one of a bowl of bright yellow lemons juxtaposed against a black background, another evoking a Dutch kitchen, with a covered copper pot resting on a crowded table draped with cloths, and a variety of landscapes (such as the one above of a Venetian canal) inspired by her travels. In the 1960s or 70s, Aunt Detty took up a new study of the human form. She produced a series of South Pacific style nudes, their graceful figures concealed tastefully by tropical flowers and trees as they silently gazed into the distance. I think that of all Aunt Detty’s paintings, the sentimental favorite was a tender portrait of her only granddaughter, Suzanne Olson, then about three or four years old. You can see a partial version of that painting below. canvas. 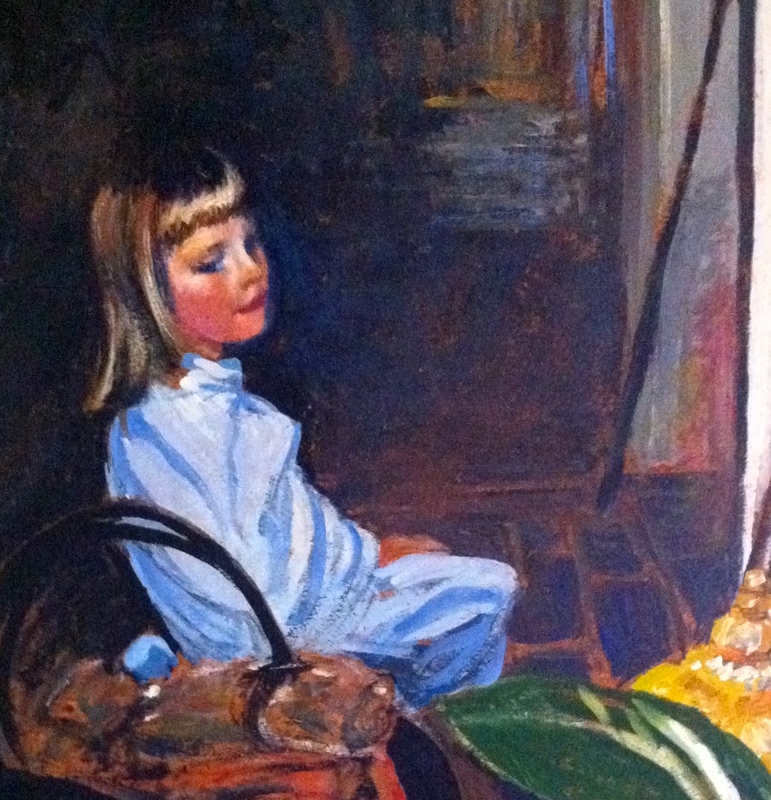 Painted by Benita McCormick, circa 1965. The lovely oil on canvas won first place in numerous art exhibits across the Peninsula. Today it hangs in a place of honor in Suzanne’s home, a treasured reminiscence of innocent days gone by. In the picture, Suzanne, dressed in a pale blue nightgown, is leaning back slightly in front of the family hearth, hands clasped and eyes fixed contentedly on something outside our view. Her rosy complexion and shoulder length golden hair glow in the light of the evening fire, as if to reflect the warmth and purity of her family’s love that surrounded her. Once we settled back in the living room, a regal-looking Aunt Detty held court from an overstuffed arm chair as she surveyed her subjects. She and my mother brought long-gone Gaffney and McGinnis relatives and ancestors back to life with their hilarious stories, breaking out albums filled with old black-and-white family pictures and occasionally pausing to sketch out jaunty family trees on napkins and scrap paper. The “scrap trees” sometimes made their way to me, and I would stuff them into my own makeshift scrapbook when we got home. On summer afternoons, we’d go down to the swimming pools with my parents and Uncle Phil. There were two pools at Woodlake: the “grownup pool” and the “kiddie pool,” where we usually played. From there we could watch our uncle stroll to the putting green, a daily ritual of his, where he would meet with his golfing buddies in the “putters’ club” and practice his strokes. At 6″4″, he was easy to spot in a crowd, with his snow-white hair peeking out of his one of his many tweed caps. Then it would be back to the apartment, where you could see the big jetliners taking off from nearby San Francisco International Airport. Most were Pan American Airways or Trans World Airlines 747s bound for exotic destinations: the Holy Land, Europe, Mexico, and the Far East. My sisters and I would watch spellbound from the balcony as the jets banked toward the Pacific Ocean and steered their course toward adventure. We knew they sometimes carried our uncle and aunt off to those exotic places and could not wait for our own turn to fly away and explore the world, too. Indeed, Aunt Detty and Uncle Phil traveled the world well into old age, thanks to the airline flight benefits they received through their daughter, Jane, – first from Trans World Airlines (TWA) and then from Delta Air Lines. They visited the Holy Land in 1962 and returned to Europe and Mexico a number of times. In their mid-80s they went to Japan, beaming as airport personnel whisked them off the plane in wheelchairs “in high style” Aunt Detty said, to save them from walking long distances. They basked in the adulation of the Japanese who paid them the high respect accorded to respected elders for the experience and wisdom of their years. Closer to home, they began volunteering to visit elderly and ill patients in local nursing homes, where they would read, teach, and sometimes just keep residents company. People often were surprised to learn that these “youngsters” visiting them were, in fact, much older than they.